Mervyn Gers, the Cape Town potter whose work is being lauded worldwide is opening a retail shop and exhibition space in the City Centre. ‘I am constantly getting requests from people to view my work and, although my studio is only 10 minutes from Town, I decided it would be more convenient for everybody to have a shop in the City centre Said Gers ‘And I have found the perfect location at 99 Loop Street, corner Loop and Church Street. It couldn’t be more perfect as this area is known for its art and antique shops. The building itself is over 100 years old and very beautiful both inside and out. Another advantage is the fact that the shop is right in the middle of Cape Town’s ‘Art Walk’. On the first Thursday of every month, Cape Town’s central city comes alive as dozens of art galleries and stores are open until 9pm. And the next Art Walk if on December 5 – two days after the Mervyn Gers Ceramics shop is launched. All of Mervyn’s work from his iconic Koi Fish range and Matisse inspired work to his monochromatic and special bespoke ranges will be on display and for sale. 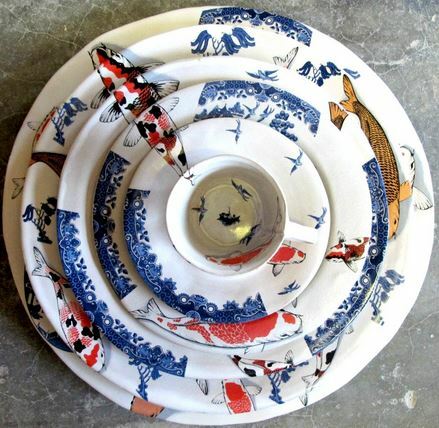 All the details and photographs of Mervyn’s work can be found on his website Mervyn Gers Ceramics.